The value of the variation between Brent and West Texas Intermediary (WTI) has gained further importance for the tanker market since the removal of the US crude export ban. This is because it provides cargo holders with new commercial opportunities, dictating tanker trading patterns and global tanker demand, McQuilling Services said in a new report. The repeal of the ban on US exports in late 2015 opened a variety of new markets beyond Canada for US crude oil. In the first five months of this year, crude exports averaged just under 500,000 barrels per day with only 61% heading to Canada, down from a 92% average in 2015, according to the US EIA. The remaining 204,000 barrels per day were exported to countries, including the Netherlands, Curacao, Singapore, Italy and the UK. Curacao was the most popular destination for US crude next to Canada, with exports averaging 54,000 barrels per day in 2016. Venezuela’s state-owned oil company, Petroleos de Venezuela (PDVSA) uses refining and storage infrastructure on the Caribbean island to facilitate the blending of US light oil with its domestic heavy grades for re-export to the East among other destinations. The Netherlands is the third largest US crude export destination with exports to the European country averaging 39,000 barrels per day through the first five months of this year. Demand for new crude sources outside of Europe is also growing amid lower production levels at North Sea oilfields and volatile supply in West Africa and North Africa. Another major destination for US crude exports is the East, as steady volumes to Singapore and Japan have been observed. Data provided by JBC Energy indicated increasing demand for light distillates, such as gasoline and naphtha in the Far East and Southeast Asia since 2013, which is expected to continue. In the summer months of June and July, the market saw lower US crude exports, driven by a weaker Brent/WTI spread. In June, Brent posted a discount to WTI for the majority of the month causing the spread to average $0.45 per barrel. Moving into July, Brent was pricing at an average of $0.15 per barrel above WTI. Reported crude charter activity declined to six total fixtures during June and July, while May recorded five market fixtures. US EIA data further supported this notion, as total US exports fell 42% in June; however, the late summer widening of the Brent/WTI spread from $0.54 to $2.73 in August reversed this trend. Market reported crude fixtures out of the US Gulf increased by seven month-on-month, to total nine cargoes for August. This activity is similar to the seven crude cargoes seen out of the US Gulf in April; however, the stem size increased. The April cargoes averaged over 93,000 tonnes shipped on five Aframaxes, one Panamax and one co-loaded VLCC. The August cargoes were taken on two Aframaxes and seven Suezmaxes. Another trend to note is that more US crude cargoes were destined to the East in 2016. The wider range of destinations opens opportunities for longer haul voyages and may support overall tonne/mile demand, McQuilling said. August fixture data showed that seven US crude cargoes went East, compared to two voyages to South America. The recent destination of choice in the East was Singapore, as three crude fixtures were reported for August, more than any other month this year. Two of these charters were fixed by a major trading house, who has traditionally sourced from the UK/Cont and West Africa to satisfy Asian crude demand. In August, the freight rate for a VLCC on the West Africa/Singapore trade averaged $1.14 per barrel, while the rate for a Suezmax on the US Gulf/Singapore trade averaged $2.47 per barrel, representing a $1.33 per barrel cost variance. Despite the recent calm, supply disruptions continued to be a concern in West Africa as militant attacks compromised key Nigerian oil terminals, while production levels in Angola remained relatively flat, due to curbed investment and operational challenges. Lower oil supply in Europe, coupled with production disruptions in West Africa, could support Brent pricing and further widen the premium to WTI. US production may have found a bottom as the rig count inched higher. Increasing production could pressure the pricing of WTI-linked crudes and create a higher discount to the North Sea grade, potentially resulting in more Suezmax and Aframax loadings in the US Gulf. Forecasting to the end of 2016, McQuilling expected Suezmax freight rates on the US Gulf/Singapore trade to average $3.35 per barrel, while rates for a VLCC on the West Africa/Singapore route was anticipated to average $1.84 per barrel- a $1.51 per barrel cost variance. Longer haul voyages from the West to the East would help support tonne/mile demand, increasing fleet usage and potentially adding some support to freight rates in the fourth quarter, McQuilling concluded. OPEC’s decision to cut production on Thursday has taken analysts by surprise but most think it will put around $10 on Brent going forward. It is too early to say how the drop will affect the tanker market and even if all member countries will abide by the ruling. 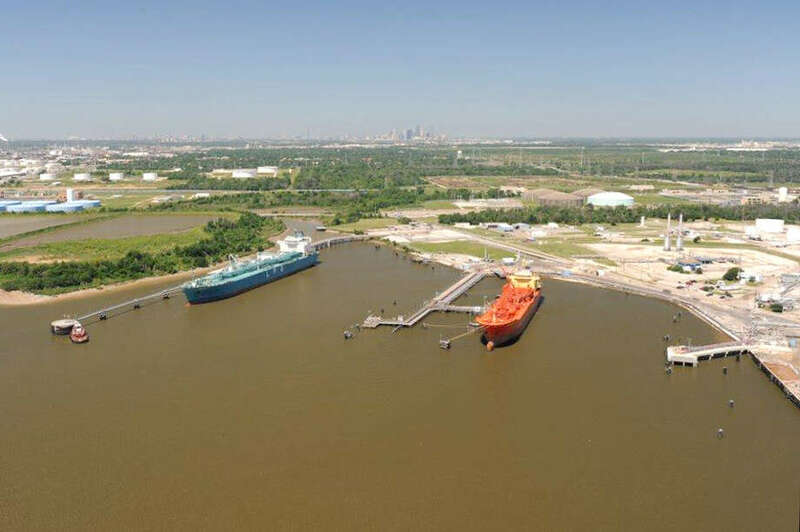 The Galena Park Marine Terminal is one of only two commercial propane export facilities in the U.S. Gulf Coast, according to Targa Resources. Targa Resources, a provider of midstream natural gas and NGL services, is being recognized in the Chronicle 100 special section. Propane is now the second-largest U.S. petroleum product export, surpassing motor gasoline, the Energy Information Administration reported Wednesday. U.S. propane exports increased from 562,000 barrels per day in the first half of 2015 to 793,000 bpd in the first half 2016. Exports to Asia and Oceania accounted for 94 percent of this growth. Japan imported the most U.S. propane at 159,000 bpd in the first half of 2016, an increase of 111,000 bpd from 48,000 bpd in the first half 2015. Exports to Panama, however, fell from 41,000 bpd in the first half 2015 to 7,000 bpd in the first half 2016, according to the report. The EIA said the large increases in exports to Japan and the significant drop to Panama might be explained by reduced ship-to-ship transfer activity. As a result, some data represent delivery to the transfer site — such as Panama, Aruba and the Dominican Republic — and not the final destination, which can skew the actual final destination numbers. A Panama Canal construction project to accommodate larger vessels recently was finished, and there have been fewer propane transfers. Demand for propane in Asia is driven largely by an expanding petrochemical industry that uses propane as a feedstock, as well as other industrial and consumer heating and cooking demand, according to the April report. Wednesday’s report also said Mexico (775,000 bpd), Canada (579,000 bpd) and the Netherlands (271,000 bpd) received the significant volumes of U.S. petroleum products in the first half of 2016. Gasoline exports increased 138,000 bpd in the first half of 2016 compared with the first half of 2015. Mexico represents the largest single recipient of U.S. gasoline exports at 363,000 bpd, up from 283,000 bpd in the first half of 2015, the EIA said. ALGIERS, Algeria—OPEC reached an understanding that a crude-oil-production cut is needed to lift petroleum prices, Iran’s oil minister said, but the group will wait until November to finalize a plan to tackle a supply glut. The consensus was reached Wednesday after a 4½ hour meeting in the Algerian capital. It represents the first collective acknowledgment from the Organization of the Petroleum Exporting Countries that it needed to take action to alleviate an oil-price slump that has wreaked havoc on the economies of oil producers. OPEC, whose 14 members control over a third of world oil output, has been producing at record levels as its members compete among themselves for buyers. OPEC has proposed cutting its collective production to between 32.5 million barrels a day and 33 million barrels a day, down from August levels of 33.2 million barrels a day, Iranian Oil Minister Bijan Zanganeh said, according to the Iranian state media service Shana. Heard on the Street: Understanding or Misunderstanding? “Today, an exceptional decision was made at OPEC,” Mr. Zanganeh said. Exactly how the production cuts would be achieved is unclear. Mr. Zanganeh said a committee would be formed to determine how much each country would have to cut and then report to the group at its next meeting on Nov. 30 in Vienna. A person familiar with the matter said the output cuts would be discussed with non-OPEC members soon. The prospect of OPEC returning to its traditional role of propping up oil prices with production cuts—a weapon it had kept sheathed since oil prices fell in 2014—sent the crude market on a wild ride. Prices rose more than 5%, to above $49 a barrel, after reports of a deal surfaced Wednesday following a volatile day of trading. OPEC kicked off Wednesday’s meeting against a bleak backdrop in the oil industry. After years of prices around or above $100 a barrel, oil prices fell below $30 a barrel this year for the first time in over a decade and have remained stuck between $40 and $50 for months. It has resulted in cheap energy costs for consumers but also tens of thousands of layoffs in the petroleum business, which has dragged on the U.S. economy at times. OPEC hasn’t taken any concrete action to help the market since prices first began falling in 2014. Saudi Arabia, the group’s de facto leader, reasoned that an American shale-oil boom made OPEC’s traditional move of cutting production levels less effective at propping up the market. Instead, Saudi Arabia and other OPEC members opened the spigots full blast and pumped record levels in a competition for market share. The previous position of Saudi Arabia’s oil officials had been that low oil prices would push shale producers out of the market, and that prices would eventually rise as demand overtakes falling supply. But U.S. production has been more resilient than most observers expected, and billions of barrels of the world’s vast oversupply of oil has been put into storage, delaying the day when demand catches up to supply. At OPEC’s last meeting, in June, when the group took no action, OPEC believed supply and demand would harmonize—and prices would recover—late this year or early next. Saudi Energy Minister Khalid al-Falih said this week that the market needed reassurance, “a gentle adjustment.” It wasn’t a call for significant action, but it represented a departure from Mr. Falih’s predecessor, Ali al-Naimi, who had declared that OPEC was no longer a cartel and that the days of production cuts were over. Oil futures gained ground Wednesday as traders awaited news from major producers holding discussions in Algeria on potential limits on production levels. A fourth-straight, unexpected weekly decline in U.S. crude inventories, also helped to pitch futures higher. Members of the Organization of the Petroleum Exporting Countries and other big oil producers were holding discussions Wednesday on the sidelines of an energy forum in Algeria on ways to help stabilize the oil market. OPEC may announce an agreement on an output freeze after the meeting, but it won’t offer full details until the official Nov. 30 cartel meeting in Vienna, Reuters said in a tweet Wednesday, citing sources. November West Texas Intermediate crude CLX6, +2.71% added $1.07, or 2.4%, to $45.74 a barrel on the New York Mercantile Exchange trading new the session’s high of $45.89 after tapping a low of $44.45. The November contract for global crude benchmark Brent LCOX6, +3.13% was up $1.18, or 2.6%, to $47.15 a barrel on the ICE Futures exchange in London. But the meeting isn’t expected to result in any official agreement among producers an official from Saudi Arabia has said that the meeting is “consultative.” A decision isn’t expected to be made until OPEC’s next meeting in Vienna on Nov. 30. Recent “comments [from] the Saudi Arabian and Iranian oil ministers indicate the ongoing stalemate,” said Matt Smith, director of commodity research at ClipperData. On Wednesday, the U.S. Energy Information Administration reported that domestic crude supplies fell unexpectedly for a fourth week in a row. Crude inventories fell by 1.9 million barrels in the week ended Sept. 23. A 3.2 million-barrel climb was expected by analysts polled by S&P Global Platts, while the American Petroleum Institute late Tuesday reported a decline of 752,000 barrels. Coming into the fourth quarter, Macaluso said he expected to see consecutive builds in crude supplies as refinery maintenance season begins. “Following numerous large draw’s this month, the price of oil is a telling tail of how over supplied the market is with prices still trading in a tight range,” he said. Gasoline supplies, meanwhile, rose by 2 million barrels, while distillate stockpiles were down 1.9 million barrels, according to the EIA. On Nymex, October gasoline RBV6, +3.30% rose 3.2 cents, or 2.3%, to $1.426 a gallon and October heating oil HOV6, +3.27% added 4.4 cents, or 3.1%, to $1.454 a gallon. October natural gas NGV16, -1.97% fell by 8.8 cents, or 2.9%, to $2.908 per million British thermal units, in volatile trading ahead of the contract’s expiration at Wednesday’s settlement. The EIA report also showed that total U.S. crude production edged down by 15,000 barrels a day to 8.497 million barrels a day last week, after a modest increase in the previous week. President Muhammadu Buhari’s economic advisers are working on a plan “to generate immediate large injection of funds into the economy through asset sales, advance payment for license rounds, infrastructure concessioning,” to help deal with the slump in oil revenue, Budget Minister Udoma Udo Udoma said in a Sept. 24 statement. The ministry of Petroleum Resources is examining what oil assets could be sold, Udoma’s spokesman, James Akpandem, said last week. Battered by low oil prices and a dearth of foreign investment, Nigeria’s economy will probably shrink in 2016 for the first time in 25 years, according to the International Monetary Fund, which forecasts a 1.8 percent contraction. A 15-month currency peg, fuel and power shortages and a slump in crude production, have cut output. The country’s foreign-exchange reserves have fallen by more than a third since the end of September 2014 to $24.8 billion. Selling upstream assets “will most likely change the structure of the Nigerian oil industry,” Chijioke Nwaozuzu, a professor at the Institute of Petroleum Economics at the University of Port Harcourt, the country’s oil hub, said by phone. A transfer of petroleum reserves to private investors would diminish government influence in the sector, likely resulting in improved efficiency and capacity utilization and “it could also mean mortgaging future crude-oil exports,” he said. Nigeria has an average 55 percent stake in joint ventures run by Royal Dutch Shell Plc, Exxon Mobil Corp., Chevron Corp., Total SA and Eni SpA. These account for about 90 percent of Nigeria’s oil production, which generates roughly two thirds of government revenue. The state also owns 49 percent of Nigeria LNG Ltd, a multibillion-dollar company which operates Africa’s biggest liquefied natural gas plant. The sale of such stakes, augmented by offshore borrowing, would help the country raise the $15 billion that is needed to revive the economy, Africa’s richest man, Aliko Dangote, said in an interview with Bloomberg TV on Sept. 22. If the authorities decide to proceed with the sale of energy assets “it will ideally be to the existing partners who wish to increase their share,” Udoma’s spokesman, Akpandem, said. Any such deal would include a repurchase clause, he said. 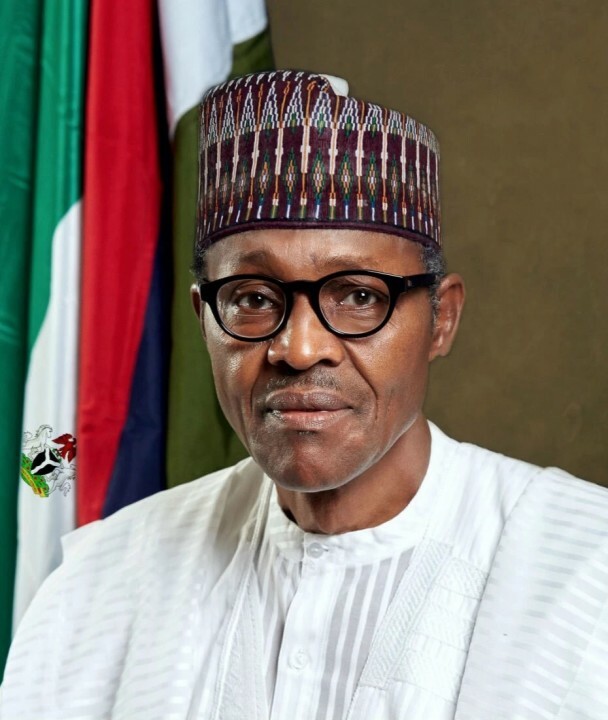 Buhari approved a 6.1 trillion naira ($19.4 billion) budget for this year and said he expected the government to raise about $5 billion from the Eurobond market and multilateral lenders. Higher borrowing costs and the loss of almost half of the revenue projected for this year could push Nigeria’s debt service-to-revenue ratio above the projected 35 percent, according to documents from the budget and national planning ministry. Dangote has recommended the state parts with some of its shares in NLNG, jointly owned with Shell, Total and Eni. Senate President Bukola Saraki has advocated for the sale of oil and gas interests and the privatization of airports and refineries, while former central bank governor Muhammadu Sanusi II said parting with assets could be done without hurting the government’s strategic interests and would give incentives to private investors. Oil workers warned on Sept. 25 that they would go on strike if national assets were sold. “Given the economic situation and the challenges, the rationale is there,” Rolake Akinkugbe, head of energy and natural resources at Lagos-based FBN Quest, said by phone. 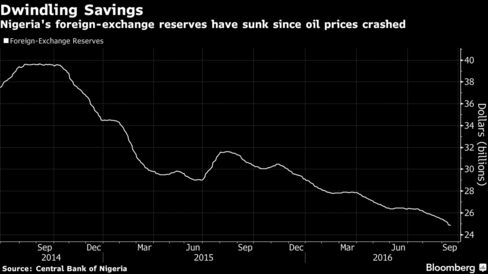 Nigeria is likely to do away with those oil fields where it has struggled to meet its share of capital contributions, leaving it with arrears of about $6 billion, she said. The timing though, with oil prices at about half their 2014 levels and insecurity in the Niger River delta where militants are sabotaging oil and gas infrastructure, may not be right, according to Ayodeji Dawodu, a research analyst at Lagos-based Investment One. A fire on a tanker carrying gasoline and diesel off Mexico's Gulf coast was put out Sunday, a day after the blaze began, the country's state oil company said. A Pemex statement Sunday night said experts have begun investigating to determine what caused the fire in two of the ship's tanks. It said specialists from a Texas salvage company had boarded the vessel. Earlier in the day, the company had said the Burgos' double hull had prevented any fuel spill. It said that the volatility of the gasoline and diesel on the ship would aid in its evaporation. Mexico's environmental protection agency, Profepa, said Sunday in a statement that a mile (1½ kilometers) of containment booms were deployed to prevent any spilled fuel from reaching the coast. The Niger Delta Avengers (NDA), a militant group in Nigeria’s Niger Delta, carried out its first attack on oil installations since declaring a ceasefire last month. The NDA said on their website that they had taken out the Bonny crude export line in their attack on September 23. “While we were promised that the concerns of the Niger Delta will be addressed once a truce is declared, the activities of the government and her agents are not assuring enough, there has been no progress,” the group said as reason for the latest attack. The NDA did say however that it was still in favor of dialogue and negotiations with the government. The MEG VLCC market remained much the same with rates hovering around recent levels, while charterers continued to drip feed their requirement into the market, which remained oversupplied, Fearnleys reported. The Atlantic saw renewed interest from charterers and levels increased from NSea, Caribs and WAfrica. However, the WAfrica hike was short lived, as rates corrected down to last week’s levels. Although modern tonnage open in the East has found employment ex WAfrica, the supply situation in MEG was unchanged with no improvement on the horizon. In the past week, Suezmaxes in the Atlantic basin saw considerable gains. However, the situation was compounded by several charterers holding back on 3rd decade of September stems hoping they could overcome the owners sentiment. Vessels were steadily fixed in the Med/Black Sea and the availability in WAfrica tightened, resulting in owners capitalising and by the end of the week, rates moved into the mid WS60s. The pressure then moved into 1st decade Oct dates, as owners held back on offers and charterers paying up to WS85 for last done WAfrica/UK-Cont-Med. The Med/Black sea markets saw healthy gains at more sustainable levels. We anticipate West Africa to rates to rise towards WS90 for TD20 with continued bullish sentiment from owners into the early 2nd decade of Oct.
Aframax rates in the North Sea and Baltic dropped a couple of points on the back of a quiet end to last week. However, a busier Baltic programme for October fuelled owners with more optimism. At the time of writing (Wednesday) we are experiencing a rate rebound and we expect this firm sentiment to continue for the first decade of October, Fearnleys said. In the Med and Black Sea, the firming trend from last week continued. We have seen everything from WS100 to WS115 being fixed, much depending on the laycan. The list is very tight for charterers looking for prompt dates. Going forward, we believe the market will stabilise, as cargo activity is expected to slow for the beginning of October, Fearnleys concluded. Elsewhere in the charter market, broking sources reported that Penfield had taken the 2007-built LR2 ‘Galway Spirit’ for two years at $17,000 per day, while PBF reportedly took the 2009-built Aframax ‘Emerald Spirit’ for 12-18 months at $17,500 per day. Vitol was thought to have extended the charter of the two LR1 sisters ‘Jo Pinan’ and ‘Jo Redwood’ for another 12 months at $14,250 per day each, while Scorpio was said to have taken the 2005-built MR ‘Jag Pooja’ for 12 months at $14,500 per day. Elsewhere, Navig8 Chemical Tankers entered into a sale and leaseback transaction with subsidiaries of Japan-based SBI Holdings (SBI) for two 25,000 dwt stainless steel chemical tankers being built by Kitanihon Shipbuilding. Crédit Agricole Corporate and Investment Bank (CA-CIB) is providing debt financing to SBI in connection with the transaction. Under the agreements, the vessels will be purchased by SBI from the company on their respective deliveries from Kitanihon. In turn, Navig8 has entered into 11-year bareboat charters for the vessels, commencing at the time of their deliveries. The company also has purchase options to re-acquire the vessels during the charter period, with the first such option exercisable on or around the fifth anniversary of each vessel delivery. The net proceeds from the transaction to Navig8 will be $74 mill. In connection with the above arrangements, CA-CIB will also provide debt financing of up to $24,860,540 to reimburse Navig8 in respect of pre-delivery instalments already paid to Kitanihon for the vessels, which will be repaid upon the delivery of the vessels from the shipyard. Hyundai Heavy Industries has reportedly secured a refund guarantee for a recent order to build two tankers for a Greek shipowner. Acording to the Yonhap News Agency, the refund guarantee has been provided by a group of banks led by KEB-Hana Bank. Yonhap did not reveal the name of the shipowner. 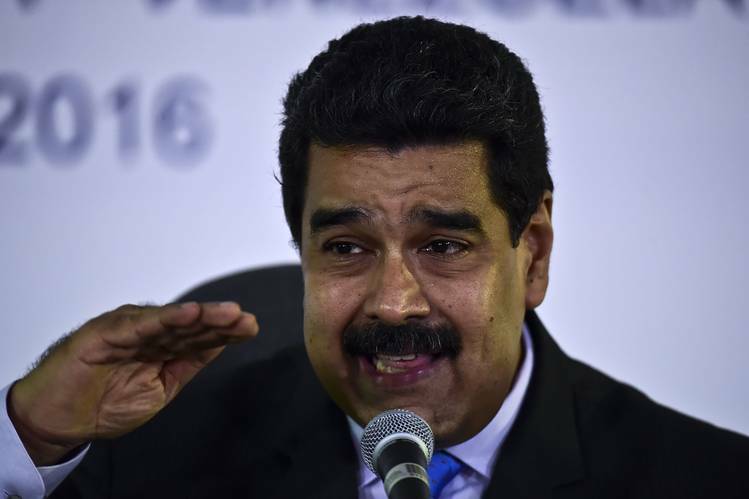 LONDON—A now-familiar pattern ensued Monday after Venezuelan President Nicolás Maduro said the world’s big oil producers were close to clinching an output deal—oil prices rose more than 1% early that day, and then quickly fell, posting losses by Tuesday. It was among the most recent in a series of optimistic assessments about a potential deal by members of the Organization of the Petroleum Exporting Countries. But oil traders and analysts increasingly see the statements as an OPEC ploy to prop up prices short term. Few analysts and investors believe OPEC will come to a meaningful agreement in Algiers when they hold informal talks on Wednesday afternoon on the sidelines of the International Energy Forum. Some OPEC officials say Mr. Maduro and others are issuing statements simply to keep a floor under prices, which sunk to less than $28 a barrel this year and have remained stubbornly under $50 a barrel. The strategy of talking up prices is arguably the last arrow in OPEC’s quiver. The cartel once saw its role as an oil-price maker, able to swing the market up or down by regulating its own production to match global demand. But an American oil boom made OPEC’s production less relevant to prices, and OPEC members like Saudi Arabia are now instead competing fiercely to maintain their share of the market by pumping full tilt. Internal divisions such as the geopolitical rivalry for power in the Middle East between Saudi Arabia and Iran have made reaching a consensus difficult. The cartel has failed to take any action to pump up the oil market at three formal meetings since prices began sliding in 2014, and an attempt to launch a so-called production freeze in conjunction with Russia fell apart in April when Saudi Arabia walked away because Iran refused to participate. Without the ability to influence the physical supply side of the oil market, OPEC has few options to boost stagnant oil prices that are far below the $100 a barrel that members like Venezuela need to balance their national budgets. Oil-price bounces provide short-term cash injections for OPEC members, and their statements about oil-output cooperation show domestic audiences they are trying to do something about oil prices. Oil prices had fallen below $42 a barrel in early August to a four-month low when reports surfaced that OPEC members were holding renewed discussions about a production freeze, with talks to be held in Algiers in late September. Prices immediately went on a tear, entering bull market territory and breaking $50 a barrel last month. Prices have since fallen back, with Brent crude, the international benchmark, trading at $47.64 a barrel. Some OPEC members said that even if there isn’t a deal, their words have had an effect. 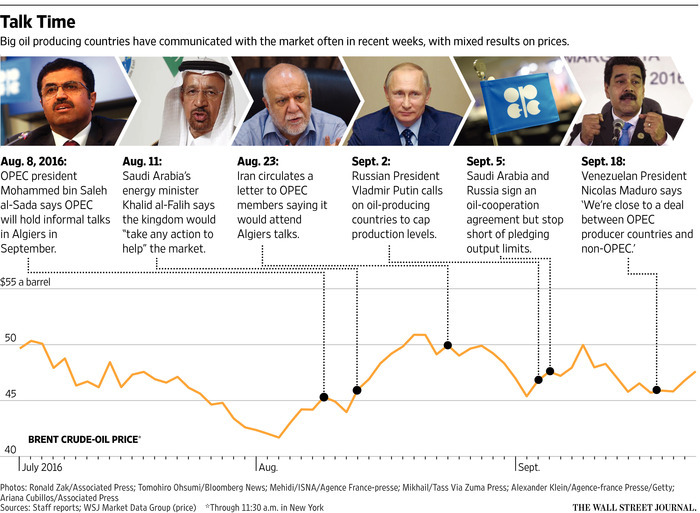 The routine has left OPEC members’ credibility in tatters with some market participants. Michael Nielsen, oil trader at Global Risk Management, said much of the initial price reaction is due to trading algorithms, which are preprogrammed to buy or sell depending on keywords in news headlines. When human traders later take the wheel, the rally often quickly dissipates. Another reason why the OPEC strategy works—even if just for a few hours or days—is that investors often buy up the talk on the expectations that others will do, too. After Saudi Arabia’s energy minister pledged to “take any action to help” the oil market last month, speculative investors piled in. Net long positions in Brent crude—or bets that prices will rise—held by hedge funds and other big money managers jumped by 22% during the week after the statement, according to data from the Intercontinental Exchange Inc.
“When those headlines come out, many react instantly as they don’t want to be caught on the wrong leg,” Mr. Nielsen said. Los Angeles Mayor Eric Garcetti announced Monday that he was tapping a Long Beach petroleum engineer to oversee oil and gas operations in the city, filling a job that had not been held full time for decades. Garcetti and his staff praised Uduak-Joe Ntuk, newly chosen as petroleum administrator, as an expert with technical knowledge who could also engage with the community. Ntuk “has the skills and background to work with our residents, industry and regulators — to help manage oil and gas activities in our neighborhoods, and play a role in steering L.A. toward a cleaner, more sustainable future,” Garcetti said in a statement. The Long Beach native has also volunteered with a nonprofit formed by former Vice President Al Gore to spotlight the problem of climate change and pursued fellowships in sustainability with the London Business School and the nonprofit Green for All. “I will focus on doing everything we can to protect the health and safety of L.A.’s communities, while taking a measured approach to the many complex issues raised by fossil fuel extraction in a large city,” Ntuk said in a statement released by Garcetti. “It was also important to the mayor and the Board of Public Works to find someone familiar with working with the community,” Petersen said. The hire had been closely watched by environmental activists with the STAND-L.A. Coalition, who complained that a City Council vote to specifically find someone with “experience or credentials” in the oil and gas field would result in candidates skewed toward the industry. Richard Parks, president of the nonprofit Redeemer Community Partnership, said he didn’t immediately see a “public health perspective” reflected in Ntuk’s credentials. “I personally don’t know him but it appears that they have turned to someone with strong ties to the industry,” Parks said, citing the fact that Ntuk had previously worked for Chevron. For decades, city codes have laid out a long list of duties for the petroleum administrator, who is supposed to coordinate all matters tied to oil and gas production across Los Angeles. But over time, the job had been reduced to an off-and-on duty performed by a city analyst. The absence of an active, involved petroleum administrator had become a bone of contention with environmental and neighborhood activists, who argue that government agencies that regulate oil and gas drilling have neglected to coordinate to protect neighbors living near urban wells. For instance, complaints about foul odors and nosebleeds near a South L.A. drilling site piled up for years before the problems grabbed headlines and AllenCo Energy Inc. agreed to suspend operations. The company has paid millions for fines and upgrades since and, under a court injunction won by City Atty. Mike Feuer, can reopen only after meeting new restrictions. Activists argue that regulators were too slow to respond to the problems, especially since L.A. had imposed conditions decades earlier that were supposed to stop odors and other hazards from bothering neighbors. The risks of oil and gas operations again drew attention after a massive gas leak just north of the city prodded thousands of people out of their homes in Porter Ranch. That debacle — along with a string of disputes over oil extraction in South L.A. neighborhoods and a lawsuit accusing the city of “rubber-stamping” drilling plans — has ramped up pressure on city officials to tighten municipal oversight over oil and gas operations. He and other city officials said he would also make recommendations to city leaders on petroleum issues, assess if drilling sites are complying with local, state and federal laws, and coordinate with other city departments to address concerns about existing sites. Ntuk is expected to start work in early October, overseeing the newly created Office of Petroleum and Natural Gas Administration and Safety within the Board of Public Works. His anticipated salary is roughly $133,500 annually. Stamford, Connecticut – 21 September 2016 – Q88 LLC announced today the launch of a new Voyage Estimator module on Q88.com. The new Voyage Estimator module can be used by ship owners, commercial operators and brokers to run what-if scenarios for prospective voyages. The new module offers Q88.com clients a single page, web-based system that delivers fast and precise voyage P&L estimates. The Voyage Estimator is an integral function of Q88’s Cloud-based Voyage Management System, Q88VMS. The full functionality of Q88VMS supports chartering, fixture creation, voyage operations including Q88’s unique inbuilt email module through which all voyage communications and data can be managed in a single workspace. Does it pay to pay for premium gasoline? Travel and leisure company AAA says it does not — and that U.S. drivers waste $2.1 billion in the past 12 months by paying for premium gas when the regular kind would do just was well. For years, energy companies have tuned their marketing to the belief that, either occasionally or frequently, springing for the pricier stuff at the pump will be a treat for your car — a cleanse of sorts, or perhaps a performance boost that saves money in the long run. For cars designed to run on regular gasoline, AAA could find no difference between premium and regular in terms of horsepower, fuel economy, or lower tailpipe emissions. “Motorists are not treating their vehicle in any meaningful way” by using premium gas when the vehicle is designed to run on regular, AAA said in a research paper released Tuesday. According to the Energy Information Administration, the share of premium gas in total gas sales has steadily increased to 11% in August and September 2015, the highest in more than a decade. The rising demand is likely driven by changes in fuel requirements for light-duty vehicles in response to fuel economy standards, although lower gasoline prices are also supporting the increase for that market, the EIA said in April. Premium gasoline is gasoline with a higher octane rating — and a fuel with a higher octane level is less prone to cause engine “knocking,” which can damage engines. If nobody talks about “engine knocking” anymore, it is because of octane, which is basically a gasoline additive. As a gasoline component, octane has taken many forms through the years, including lead (phased out for health and environmental reasons in the 1970s) and most recently ethanol. At the pump, regular gasoline will have a minimum octane rating of 87, then 89 for the mid-grade, and 91/93 for premium. While most car engines are built to run on regular gasoline (AAA said that only 16% of vehicles sold in the U.S. require premium fuel), some car makers require or recommend the higher-octane, pricier versions most to meet promised power output and fuel economy figures. That has led to the belief that premium blends — which on average cost 23% more than regular gasoline, AAA said — equal better-run cars, regardless of model or maker. Energy companies have capitalized on that belief, with “marketing campaigns that tout the cleaning abilities of their fuel detergent additive packages,” AAA said. To run its tests, AAA chose three vehicles — a Toyota Motor Co. 7203, +1.47% Tundra pickup, the Fiat Chrysler Automobiles FCA, -2.38% full-size sedan Dodge Charger, and a Mazda Motor Corp. 7261, -1.28% compact Mazda 3. Want a real treat for your car? AAA says don’t miss scheduled maintenance and maybe skip the no-name gas station with that enticing low price. Earlier this year, AAA released a study that claims to have found “significant differences” in the quality of gasoline sold in the U.S., with those meeting a standard called Top Tier performing the best and leaving less residue on engines. A list of gasoline retailers selling gasoline that meets the standard can be found here. A cargo of ExxonMobil’s Qua Iboe crude for October-loading is being offered by the US firm, the first offer on the grade in over a month. The US firm declared force majeure on the Qua Iboe crude in July after a leak on the pipeline that feeds the oil to the export terminal was discovered. The cargo is offered for October 8-16 loading at a premium of $1.80 per barrel to dated Brent, sources said in a Reuters report. The VLCC market ex MEG saw steady demand during the latter part of last week, but the lukewarm sentiment did not carry over into this week. Rates remained stable, but corrected half a point down in the early part of this week for MEG/West, while MEG/East saw an increase of one to two points, Fearnleys reported. The overhang of tonnage decreased and bad weather in the Far East may further delay a few vessels. However, there was still enough tonnage to cover charterers expected demand. The Atlantic Basin also saw more of the same with steady activity and charterers managed to maintain recent levels except for WAfrica, where demand on fairly prompt dates brought levels up to WS42.5-45 level for the WAfrica/East run. Suezmaxes in West Africa remained more or less unchanged last week with the exception of some prompt replacement deals that paid up. At time of writing (Wednesday), the tonnage list has seemingly become tighter, due to steady activity in all areas, combined with the paper trading up for October dates. On the back of the above, owners bullish sentiment grew and expectations are for higher rates for the first decade of October fixing schedule. The Med Suezmax players have already seen the effect of less available tonnage on the back of ships being sent east and recent deals from Black Sea and Ceyhan have paid some WS5 – 7.5 points above previous deals. In the North Sea and Baltic areas, rates have settled since last week’s sudden hike. However, there seems to be a lot of different opinions whether or not this market still has the potential to firm even further. For the time being, we believe it will continue sideways, Fearnleys said. Last week’s momentum in the Med and Black Sea continued throughout this week. More cargo activity was seen than expected. A busy CPC programme and cross-med activity pushed rates above WS90. Owners were bullish for the week to come and were still holding out for higher rates, the broker concluded. Elsewhere, Gener8 Maritime took delivery of two ECO VLCCs, the ‘Gener8 Perseus’ on 9th September, 2016 and the ‘Gener8 Oceanus’ three days later from Hyundai Heavy Industries and Hyundai Samho Heavy Industries, respectively. The two VLCCs represent the 14th and 15th of 21 VLCCs due to be delivered into Gener8 Maritime's fleet. Upon delivery, both vessels entered Navig8 Group's VL8 Pool. Meanwhile, Ardmore Shipping Corpo has taken delivery of the first three of six MRs that it agreed to acquire in June, 2016. The ‘Ardmore Endurance’, ‘Ardmore Explorer’ and ‘Ardmore Engineer’ are 49,500 dwt Eco-design IMO II/III MRs built by STX Offshore and Shipbuilding in 2013, 2014 and 2014, respectively. The vessels were delivered on 31st August, 7th September and 12th September, 2016, respectively, and are currently employed in the spot market. Ardmore also announced that it has completed debt financing for the acquisition of the six vessels. Four of the vessels are being financed through a new $71.3 mill senior debt facility with ABN AMRO. The facility is an amortising senior term loan with a final maturity date in 2023. The covenants and other conditions are consistent with those of the company's existing credit facilities, it said. The remaining two vessels have been added to the existing credit facility with ABN AMRO and DVB Bank, which was completed in January, 2016. The facility has been increased by $36.6 mill, and NIBC Bank has agreed to join ABN AMRO and DVB Bank as lenders under the facility. The increase comes in two tranches to coincide with the delivery of the two vessels, and they will mature in 2023. In another move, Ardmore announced that it has agreed to sell the 2005-built, 29,000 dwt Eco-mod product/chemical tanker ‘Ardmore Centurion’ for $15.7 mill. The vessel is expected to be delivered to her new owner in late September, 2016. Anthony Gurnee, Ardmore’s CEO, commented: "We are pleased to welcome these high-quality, modern MR product/chemical tankers to Ardmore's operating fleet. Alongside the three additional vessels that are scheduled to deliver to Ardmore in the coming weeks, these recent acquisitions will expand our long-term earnings power, enhance our cost efficiency and lower our breakeven costs. We also appreciate the support of ABN AMRO, DVB Bank, and NIBC Bank in providing bank financing for all of our newly acquired vessels." Stena Bulk and Golden Ari Resources have taken delivery on a joint basis of the eighth IMOIIMAX type MR - ‘Stena Immortal’ - from Guangzhou Shipbuilding International (GSI). The Gothenburg-based owner placed an order for 13 IMOIIMAX product tankers in 2012. ‘Stena Immortal’ will be operated by Stena Weco and will become a unit of the company’s global logistics system, which employs around 60 vessels. The remaining five vessels will be delivered every third month with the last vessel one in 2018. Three of the 13 IMOIIMAX tankers are wholly owned by Stena Bulk, six together with GAR, two by Stena Bulk’s sister company Concordia Maritime and two by Stena Weco. In the charter market, broking sources reported that Scorpio had fixed the 2013-built Aframax ‘Densa Alligator’ for six option six months at $18,000 and $21,500 per day for the optional period, while Litasco was believed to have taken the 2016-built Aframax ‘STI Grace’ for six months at $18,500 per day. In addition, KNOP has granted Statoil new five one-year options. A few newbuildings were reported, including Sun Enterprises opting for a VLCC at JMU and two, option two Aframaxes from Hyundai for $47 mill each. The Aframaxes were thought to be at the LOI stage. Eastern Pacific was also said to have invested $86 mill on two Aframaxes at HHI Subic, plus two options. Navig8 was believed to be at the LOI stage for two, plus options for two, plus two, plus two MRs at Hyundai Mipo for $36 mill each. They were said to be IMO II types and are to be fitted with 18 tanks each. Kumiai Senpaku was reported to have ordered at 37,000 dwt asphalt carrier at Chengxi for 2018 delivery. The 2007-built Aframax ‘Isis’ was reported sold to Atlas Marine for $24 mill. Included in the deal was a two year charter to Phillips 66 at $19,000 per day.